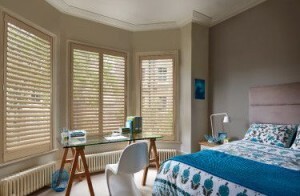 Interior Shutters | See our range - Ultrasound-Blinds.co.uk. 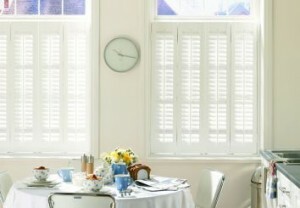 Stunning to look at, superbly practical and durable too, Ultrasound’s shutters are sure to enhance your interior. Interior Shutters are a practical and desirable addition to the home and are becoming increasingly popular in the window coverings market. 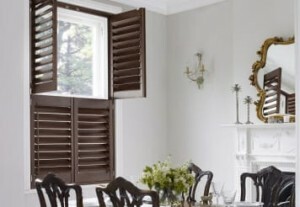 Sandringham Shutters are made-to-order with styles and finishes to suit any window, taste or budget. Available in 5 wood types. Choice of 117 painted and stained colour finishes. 4 louvre widths – 47mm, 64mm, 89mm and 114mm. Choose full height, tier-on-tier, café style, solid, tracked or shaped shutters. Solid shutters available for total privacy and light control. From initial design to the installation you can be assured of our support, and we can guarantee complete customer satisfaction. Made from premium hardwood, these Shutters extol the natural beauty of the wood and look fabulous in either stained shades or a smooth painted finishes. A real wood shutter at a stunningly affordable price. Wonderful painted finishes combining hardwood panels with MDF frames to work well in any room. One of the most popular ranges as it makes a reliable and tough shutter suitable for almost any application, at an affordable price. Made with MDF frames and ABS louvres, which are extremely tough and durable, this range has the widest choice of stunning colours to tie in with any interior decoration. This is a super lightweight, eco-friendly Shutter with an attractive wood-grain or paint finish, making it ideal for tier-on-tier installations. Phoenix Shutters are even suitable for conservatory roofs.